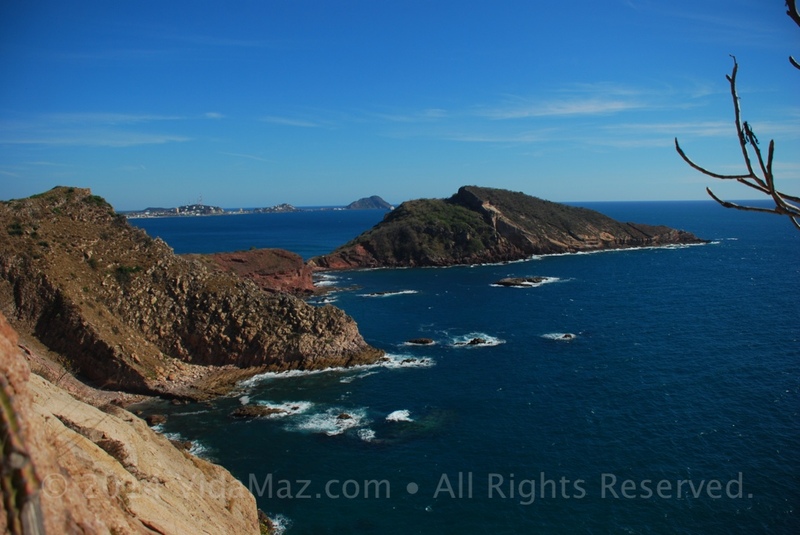 The Best Views in Mazatlán | ¡VidaMaz! Where are the best views of Mazatlán? Atop the lighthouse? From up top of the Freeman? I believe that the views from atop Deer Island rival even those taken from the air in a helicopter. They are some of the most glorious vistas our fair city has to offer. If you’ve taken a kayak, catamaran, or any other kind of lancha over to the islands, or if you’ve swum, you know that. The water around the islands is so crystal clear—the color of turquoise—and you can view Mazatlán in its entirety, from north to south, with the Sierras as a backdrop. Click on any photo to enlarge it, or to view a slideshow. Then, as you climb up the island from the beach, each hill reveals new views and surprises. I have climbed up the first hill before, but I had not done a trek of three of the four hills, as we did this past Tuesday. I have not gone to the backside of the island, and looked out from different elevations. It is truly stunning! Petroglyphs in Mazatlán. No, not Las Labradas. Here in Town. And, on Deer Island, in a cave on the back side, there are petroglyphs. Not just those north of town, in Las Labradas. There are petroglyphs right here in Mazatlán! When our friends saw the photos, they said the petroglyph of the footprint looks like proof that aliens were here. Right next to the foot is a petroglyph of an animal with a long tail. Footprint petroglyph on Deer Island, Mazatlán on the right. It’s a funny story how I discovered this. I’m taking a (wonderful!) photography class with Salvador Herrera, and loving it. Well, he invited us to Deer Island for photography practice. He advised us to wear tennis shoes, and to bring sunscreen, a lunch, and water. He also said we’d be home by 2:00 pm. Little did we know that we’d be hiking all day, in quite precarious conditions, seeing the most spectacular views imaginable, and then even rappelling down into the cave with the petroglyphs, to return home after 5:00 pm! You gotta love Mexican communication style and spontaneity! It was an incredible day! One of the students in our class is a cheerleader. He had a friend visiting him from León, and she’s a cheerleader, too. They were kind enough to do some jumps and flips for us, so we could practice our photography skills. Take a look. The cave with the petroglyphs is on the back side of Deer Island, just below the crest of the third hill. You climb up from the south side of the island, on the southern end of the beach. From the top of that first hill, you’ll proceed along the crest of the island, down and up two more hills. Then, on the top of the third hill (not the fourth or northernmost, the second from the north), you turn west and hike down in altitude a bit. The climb gets steep and is not for anyone without great balance as well as good strength and stamina. The final entrance to the cave involves a five-meter sheer drop. Agile climbers can find footholds and handholds, but we used a rappelling harness and rope for added safety. Quick! Do you know their names? Starting from the south: Isla de Lobos/Wolf or Sea Lion Island, Isla de Venados/Deer Island, and Isla de Pájaros/Bird Island. Many people and websites erroneously call the southernmost of the three islands Isla de Chivos/Goat Island, but that is actually the island in front of the lighthouse. The biodiversity of the islands in our bay is an incredible treasure. Four climactic zones are found within such a small area: semi-desert, tropical, coastal and mountains. Over 500 species of birds can be found here, including gorgeous waterfowl and my favorite, blue-footed boobies! 20% of the species found here are unique to this area—you can’t find them anywhere else! The islands are composed of volcanic rock, landslides and foothills. On the islands you can find cacti, agaves, lichen, and deciduous shrubs including lots of beautiful plumeria. Plus, of course, goats, lizards, a multitude of butterflies and other wildlife. The middle island, Deer Island, is the most-visited of the three. Its attractions include its beach, with fine white sand and crystal clear water, rippling out from the beach in increasingly darker shades of turquoise. The north side is great for snorkeling, lobsters and scallops, and it makes for a terrific kayak trip. Deer Island is 2.3 kilometers off the coast, 1.8 km, long and between 250 and 700 meters wide. It’s highest point is 178 meters (and don’t my legs know it! ), and it has an area of about 54 square hectares. Bird Island, on the north, is 120 meters high and has an area of 48.5 hectares. Goat Island is pretty much inaccessible. While most anyone in town will tell you that these three islands are an ecological preserve, and I sincerely hope they are protected by legislation, there is currently an advertisement to sell these three natural treasures.I do hope it’s a joke! Do You Know the Legend of the Three Islands? It is said that the indigenous people of this area were suffering from a succession of horrible hurricanes and flooding. The Mazatl people were beside themselves with grief; they were exhausted and starving. The village chief asked the curandero what he could do to put things right and bring prosperity back to his people. The curandero went into a trance, and told the chief that the only way to put things right would be to sacrifice one of his three daughters—one of the three beautiful princesses—in order to restore the welfare of the pueblo. The chief loved all his daughters dearly, and was distraught because he loved his pueblo, too. He just could not bear to sacrifice one of his daughters. Unbeknownst to the chief, his daughters swore a secret pact. The three of them loved their home, their neighbors, and their father so much, that they would sacrifice themselves and thereby restore the prosperity of the area. One night, under a full moon, dressed in white and with the diamond their mother had given each of them when they were born, the three princesses held hands and walked into the ocean, drowning themselves for the sake of their people. One sister’s hand came free, and she was swept slightly away from her sisters, but the other two sisters hung onto each other tightly. The morning after their sacrifice, the Mazatl people saw three gorgeous islands out in the Bay of Mazatlán! One island was located slightly to the north, on its own, while the two to the south were connected. That was when they discovered that the princesses were missing! Such an act of pure, selfless love! Thereafter, the climate changed and the weather of Mazatlán became tranquil and pleasant. To this day the three princess islands continue to protect the people, sheltering them from winds, storms and hurricanes. It is said that in the heart of each of the three islands can be found a diamond. Do you know the name of the annual swim out to Deer Island? Yes? The Travesía! Even if you are not incredibly mobile, you can get out to Deer Island on a boat and enjoy the views from the beach. If you haven’t done so, I highly encourage it. Spend the day; you’ll feel like you’ve gone to a Greek Island. If you are fit, take a hike up, at least to the first hill. The views will astound you. If you want to go to the cave, I’d recommend you go with someone who knows the route; it’s pretty tricky, at least for my level of adventurism. And, of course, we couldn’t have asked for a better day! ← Farm to Table 2014—O•M•G!!!!! Glad you enjoyed the photos, Marlene. Not sure which yellow hotel you’re referring to, as they are so many yellow buildings along the coast in MZT these days. Have a good one. Thanks for yet one more great adventure that I can and did enjoy as I sit in the cold and snow NOB!! 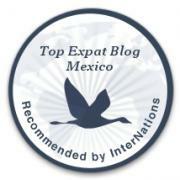 Your blog is just the best and your love of Mazatlan and all Mexico shines through as usual! Thank you for letting me know and sharing the joy! And why are you in the snow and not down here? Hopefully you are returning soon! Pingback: Body Painting at Baupres | ¡VidaMaz!